Uncertainty looms whether immediate former Wajir West MP Mohamed Kolosh will defend his seat which he lost after the Supreme Court nullified his victory with reports indicating that he has resigned from the Orange Democratic Movement Party (ODM) which sponsored him during 2017 poll. Speaking to reporters, ODM Secretary General Edwin Sifuna confirmed that Kolosh had submitted his resignation letter to the Raila Odinga-led outfit last week after the Supreme Court’s ruling. “Kolosh resigned from the party a week ago,” he said without giving further details. ODM Director of Elections Junet Mohamed in his tweeter handle on Thursday afternoon confirmed that the party had fielded another candidate following the resignation of Kolosh. The strict nomination deadlines imposed by the Independent Electoral and Boundaries Commission might have forced ODM to settle on Professor Elmi who was introduced to party leader Odinga by the National Assembly Minority Whip Mohamed on Thursday afternoon. In a Gazette Notice dated February 1, the electoral body asked respective political parties that intend to participate in the mini-poll to submit names of the candidates who will battle for the seat in primaries before Monday next week. 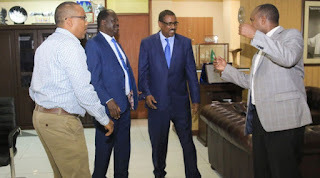 It is not yet clear whether Kolosh will defend his seat, which was contested by his competitor Abdirahman Ibrahim Mohamed (KANU) on grounds that he was not validly elected.